Happy New Year! A warm welcome to Rectory Musings in 2011. Things have been quiet here as I have been blogging on my Five Minutes' Space blog for Advent, but it is good to be back here. 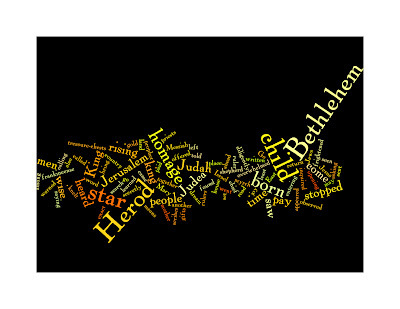 7 Then Herod secretly called for the wise men* and learned from them the exact time when the star had appeared. Then he sent them to Bethlehem, saying, ‘Go and search diligently for the child; and when you have found him, bring me word so that I may also go and pay him homage.’ When they had heard the king, they set out; and there, ahead of them, went the star that they had seen at its rising,* until it stopped over the place where the child was. When they saw that the star had stopped,* they were overwhelmed with joy. On entering the house, they saw the child with Mary his mother; and they knelt down and paid him homage. Then, opening their treasure-chests, they offered him gifts of gold, frankincense, and myrrh. And having been warned in a dream not to return to Herod, they left for their own country by another road. I am struck in the wordle how the words Bethlehem, Herod, child and homage stand out. God's coming among us happens at a certain time, in a certain place, but in history. In this case, in Bethlehem. His coming among us happens not in majesty and power, but in the vulnerability and yet simplicity of a child waiting to be loved and to love back.